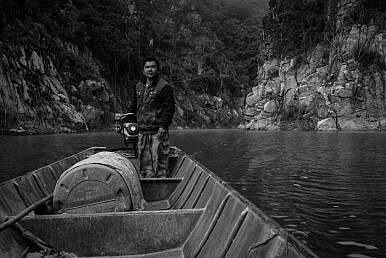 A fisherman on a Lancang (Mekong) tributary in Jinglin, Yunnan. 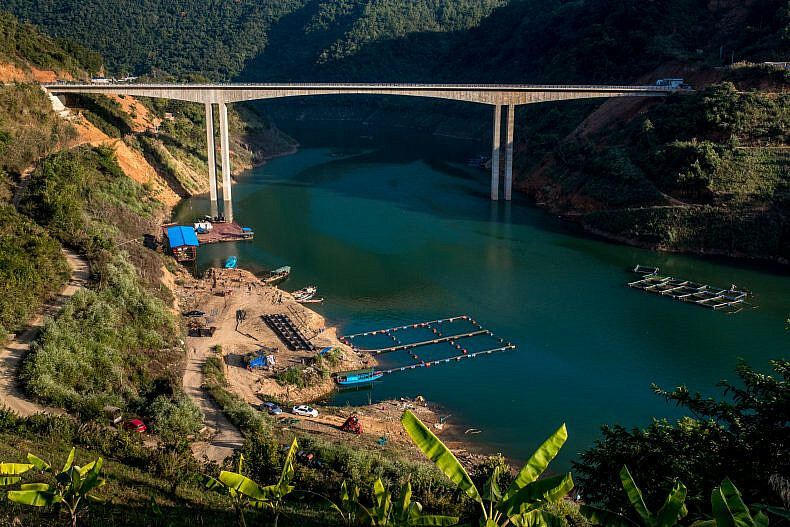 In Jinggu county, the construction of dams on the Lancang have created a recent fishing boom, though it may not last. After so much time on the Mekong, the fact that we hadn’t encountered any fishermen on the Lancang seemed unnatural. 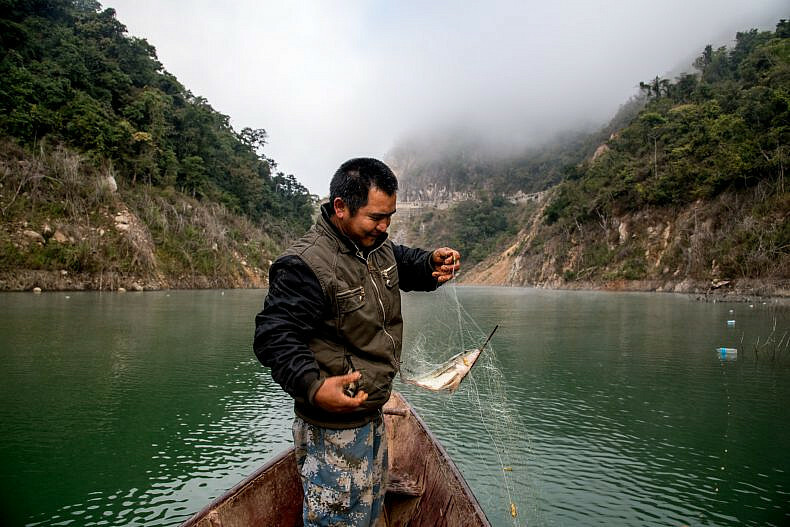 But in this river-straddling community, we learned that the rise of hydroelectric dams has given rise to a small fleet of fishermen in an unexpected way. 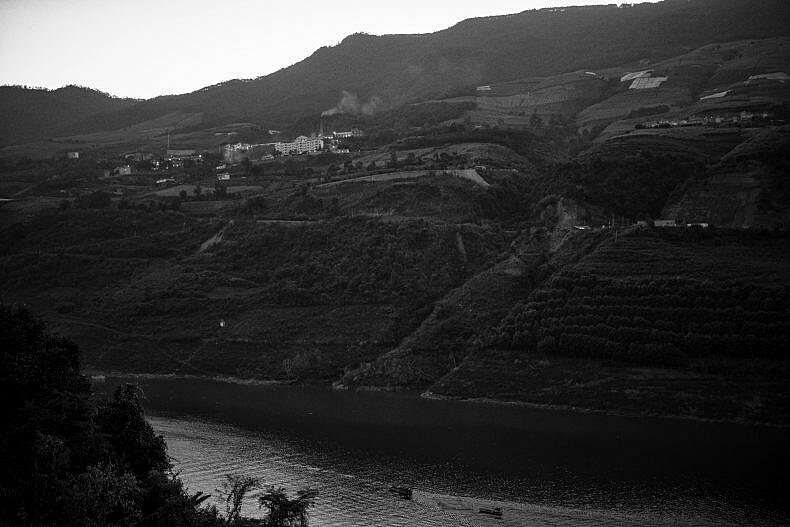 A view of one of the Lancang (Mekong) tributaries in Jinglin, Yunnan Province, China. Photo by Luc Forsyth. The first thing that grabbed our attention as we stepped off the bus in the tiny roadside community of Jinglin River Bridge was the richness of the Lancang’s surreal blue color. Though we had noted the changing characteristics of the river since entering China, the narrow and swift flowing aquamarine channel at the bottom of a deep mountain valley was so utterly different to the lazy brown Mekong that we had known for the last year as to be nearly unrecognizable. Another view of one of the Lancang (Mekong) tributaries in Jinglin. Photo by Gareth Bright. Later we would learn that the unnatural color of the river was largely due to the loss of sediment because of China’s hydropower dams along the Lancang. But in our initial ignorance we did little but stand and stare down at the alien waterway, speechless as we took in the vast landscape. The bright color of the water differs from the slow, wide, brown Mekong farther downstream. Photo by Luc Forsyth. The naming of Jinglin River Bridge was both literal and appropriate. 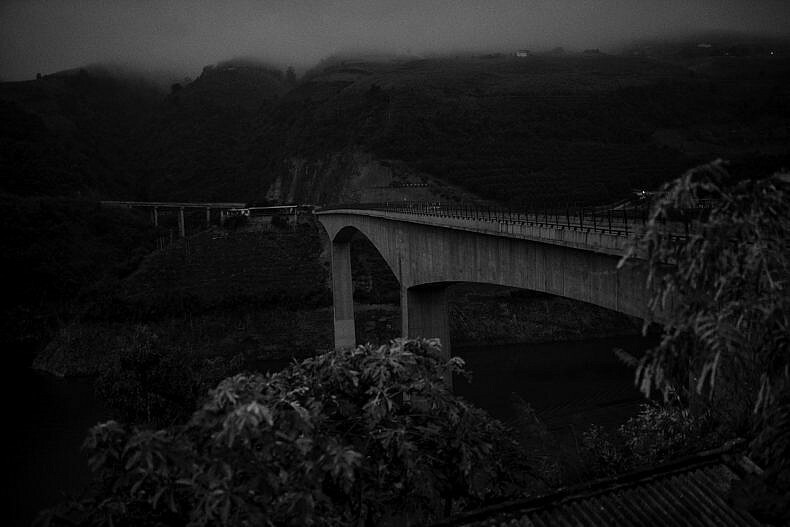 Derived from the blending of Jinggu, the name of the county the town was located in, and Lancang, the community was visually defined by, and the impressively stark concrete bridges that spanned the river in several places. Though utilitarian and without ornament, the bridges were a reminder of the scope and scale of China’s infrastructural engineering projects. In Laos or Cambodia, with their aging and potholed highways, such roadworks would have been among the best in the country; but in China, even in an out of the way backwater, they were unremarkable. 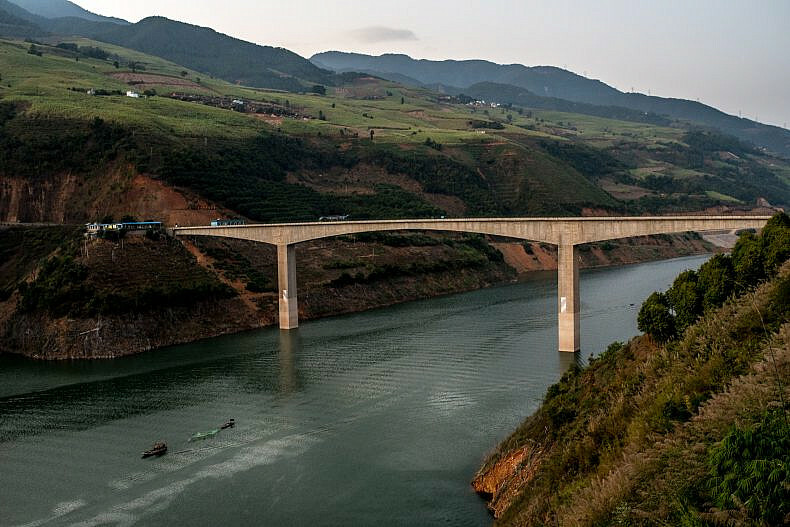 The bridges over the Lancang (Mekong) tributaries in Jinglin are nothing fancy. Photo by Gareth Bright. We had encountered tourists and retirees who enjoyed the river as a source of relaxation, farmers who irrigated their crops with its waters, and sand dredgers who plied its currents on immense metal hulks to bring its sandy bed to the surface, but none of the fishermen that had been so prevalent in the lower Mekong basin. If we were going to find such people in Yunnan, we reasoned, what better place to start looking than in a small village that had incorporated the river into its name? 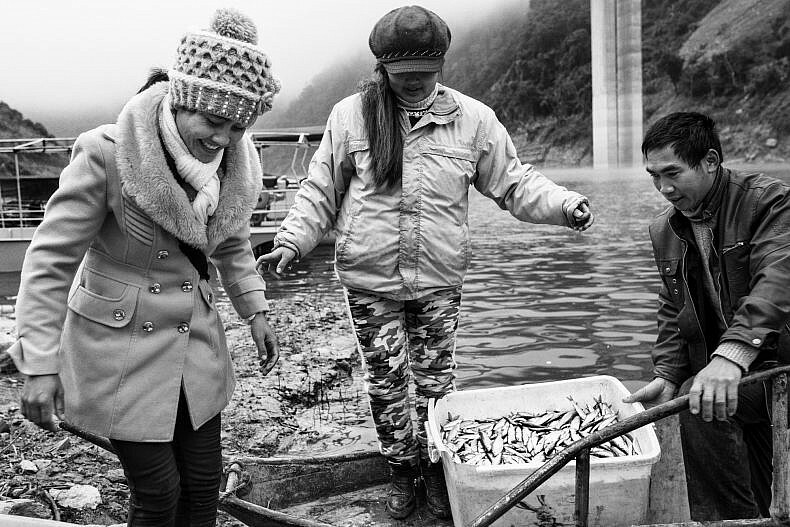 Until Jinglin, there hadn’t been any fishermen on the river in China. Photo by Luc Forsyth. Once the site of an important salt refinery, the area had been ground zero for the rising wave of discontentment among China’s lower classes over the inequality of wealth between themselves and their Kuomintang rulers. When the prices of salt rose to unaffordable levels, the rural poor formed themselves into small Communist militant groups, which would later coalesce under Mao and take part in the civil war that changed China’s political system forever. 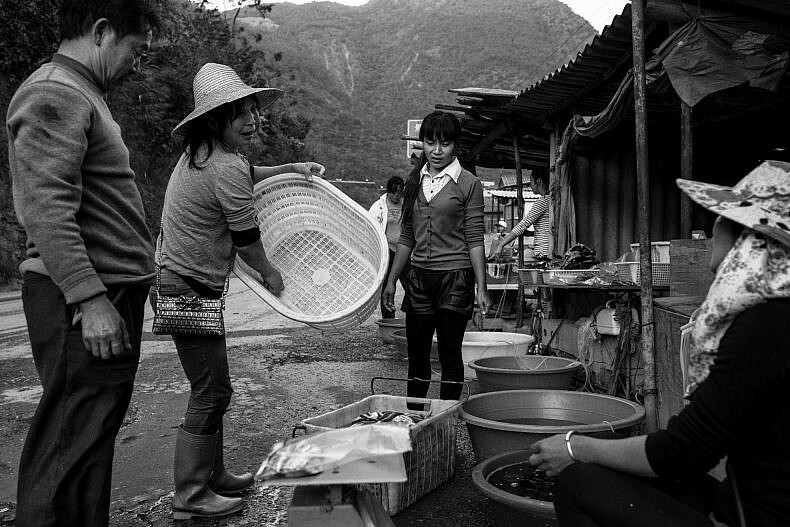 Customers stop at a road side fish market in Jinglin. Photo by Gareth Bright. 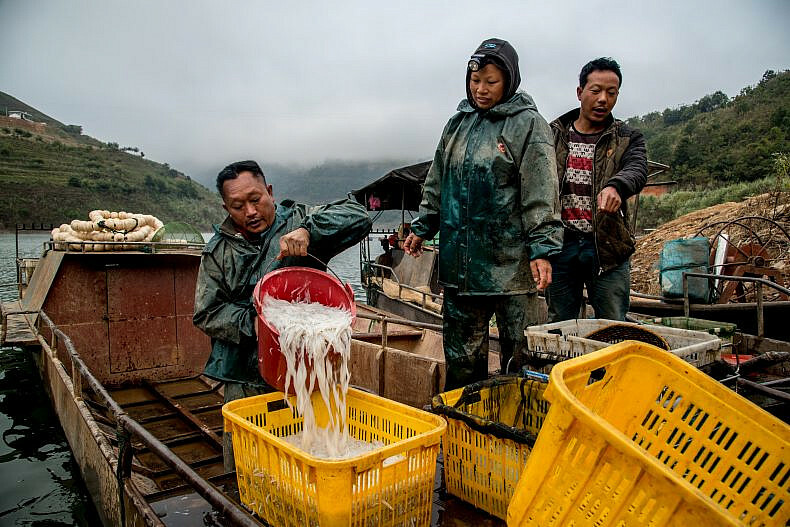 Fish vendors sort their catch at a local market in Jinglin, Yunnan province, China. Photo by Luc Forsyth. A small market was spread out along the highway, offering travelers an opportunity to pick up fresh seafood before reaching their ultimate destinations. The gathering of their parked cars gave a false impression of bustle to the town that was only transitory. The fish were live, splashing feebly in a few centimeters of water at the bottom of plastic buckets, and so we knew that fishermen could not be too far away. 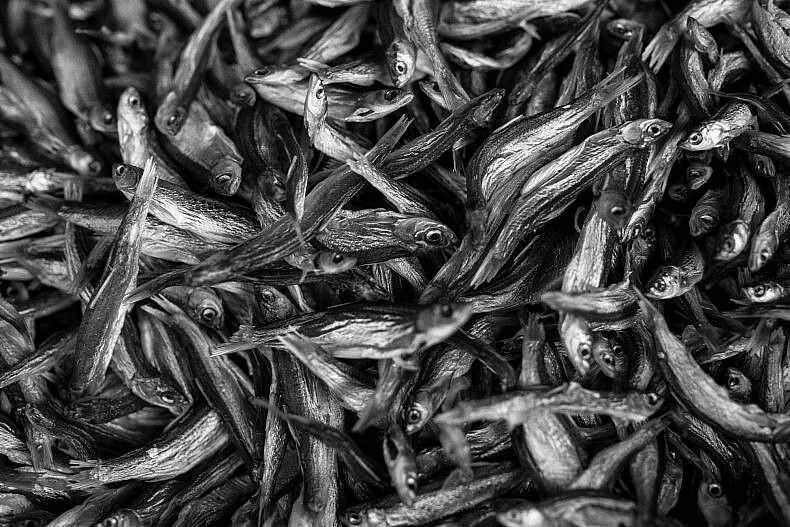 Fish hang to dry at a local market near the river in Jinglin. Photo by Gareth Bright. “I don’t really catch anything,” the father of the family said when we asked about his fishing rod. “It’s just for fun. If you want to see real fishermen, you could try coming back in the morning.” His teenage son, seemingly embarrassed by his father’s repeated attempts to offer us cigarettes and food, hurried away down the beach so as to not be drawn into the conversation. Having both survived the terrible awkwardness of being teenage boys, we empathized with his unease and left the family to their lunch. Fishermen prepare to offload their morning’s catch. Photo by Luc Forsyth. 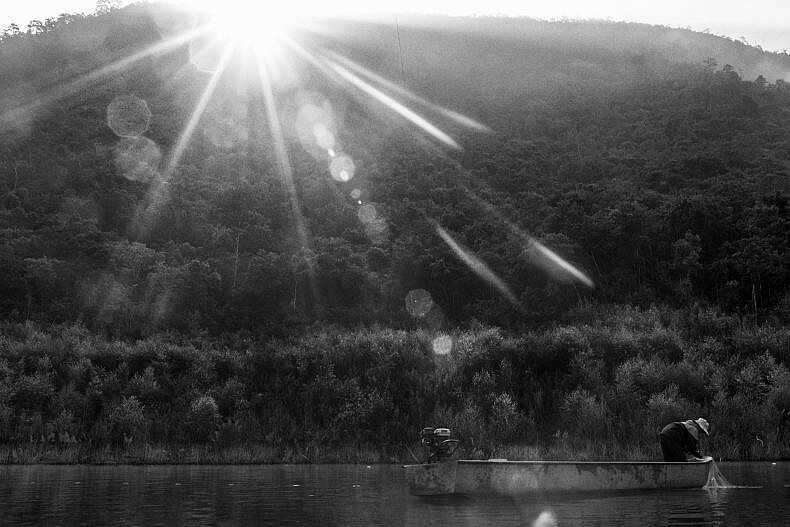 “They only started fishing here three years ago,” he continued. 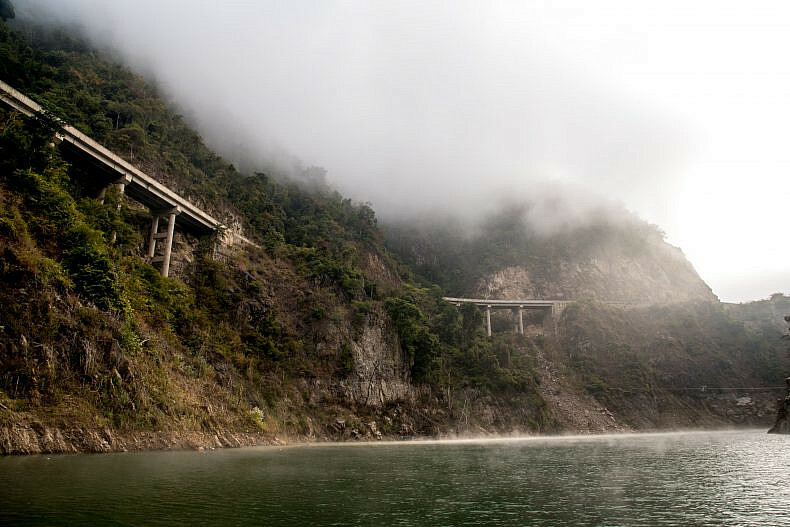 “Before the dam [near Simaogangzhen] was built the river moved too fast. 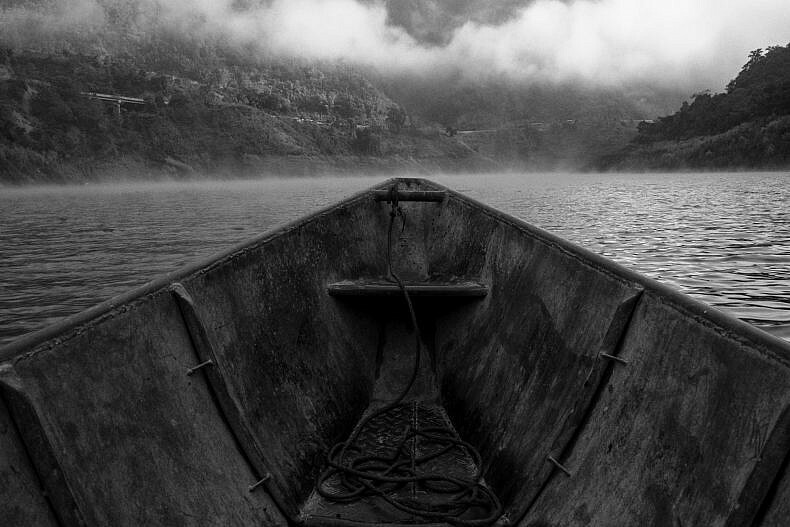 Twenty years ago if you jumped in here the currents would carry you away. It has changed a lot.” With that he pulled a cell phone from his pocket and made a call to a friend. Morning mist on the Lancang. Photo by Gareth Bright. 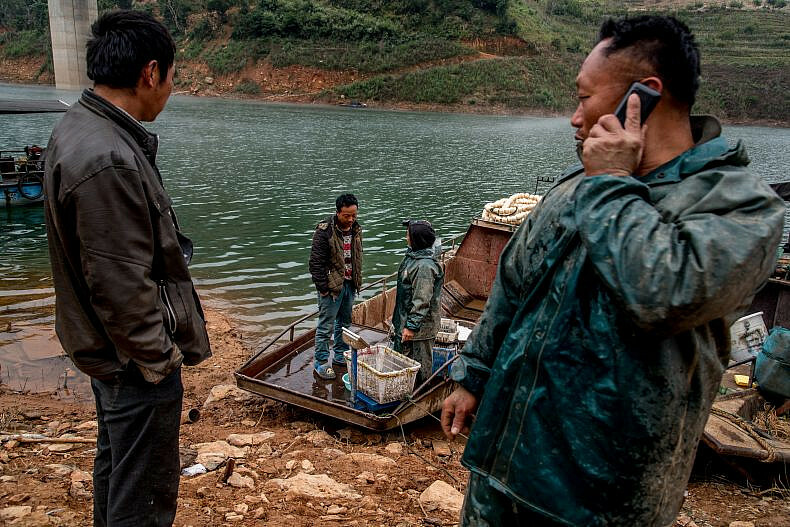 Fishermen sort their morning’s catch on a tributary of the Lancang in Yunnan, China. Photo by Luc Forsyth. 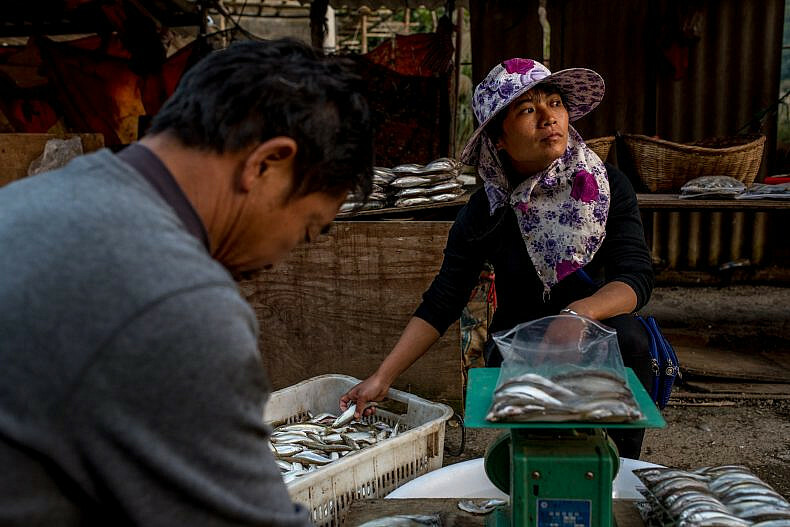 If what they said was accurate, a morning’s fishing could earn the couple more than $100 — vastly more than the small scale river fishermen we had encountered earlier in our journey who often survived on just a few dollars a day. People bring in the morning catch in Jinglin. Photo by Gareth Bright. Morning mist on a tributary of the Lancang (Mekong) river. Photo by Luc Forsyth. 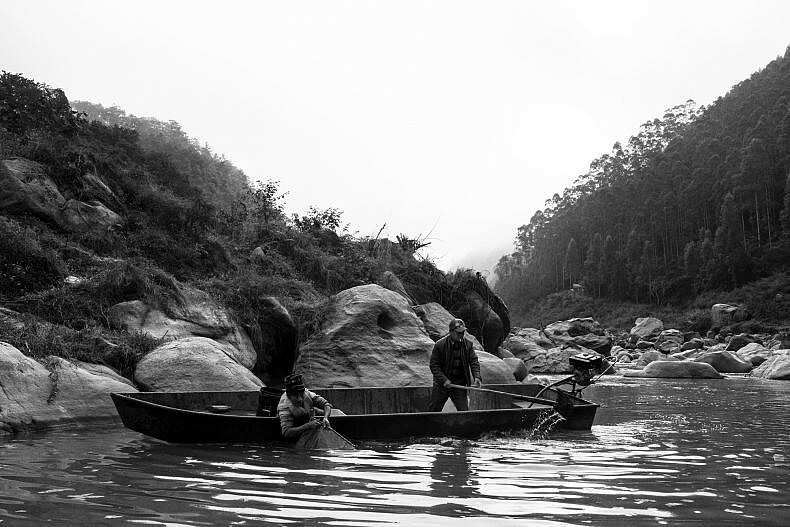 Fishermen on a tributary of the Lancang (Mekong) in Yunnan, China. Photo by Gareth Bright. This was not a traditional source of livelihood, passed down through the generations as was the case for families on Cambodia’s Tonle Sap lake or near the Khone waterfalls and 4,000 Islands of southern Laos. This was a recent and unnatural boom made possible by the taming of the river’s currents by hydroelectric dams, and local residents were taking advantage of the bonanza while it lasted. We knew from previous conversations with biologists that dams almost always disrupted the migration of river fish and that once depleted it was unlikely that stocks in the area would rebound. But for now, Su and his friends were enjoying the unexpected boon and not dwelling on thoughts of the future. A fishermen checks his net on a tributary of the Lancang (Mekong) river in Jinglin. Photo by Luc Forsyth. 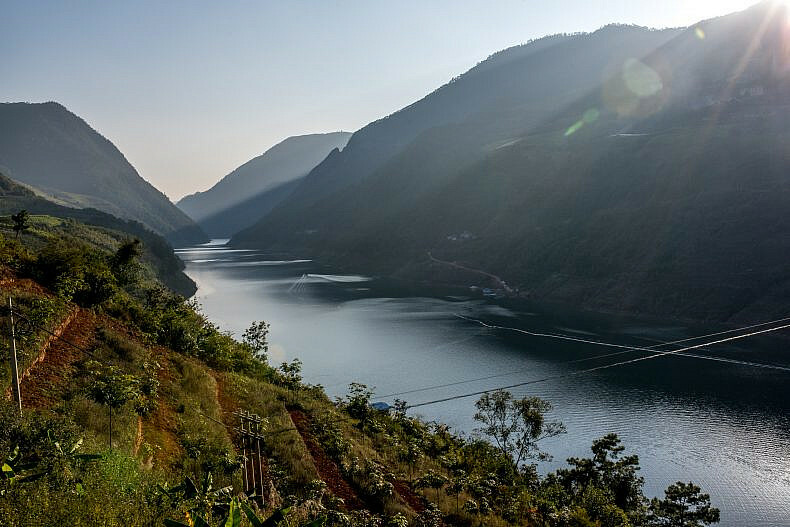 A view of one of the Lancang (Mekong) tributaries in Jinglin, Yunnan Province, China. Photo by Gareth Bright.